Our Calgary location which services the city and surrounding areas has been in operation since 2005. Offering industry leading paintless Dent Repair, a strong commitment to customer service, and a quality control process which is second to none, we have managed continued growth which has brought us to our new location, 433 – 58 Avenue SE. We typically have 5 full time employees and any number highly skilled technicians available at any given time. Calgary is growing and it’s turning into a busy city. Because of this, parking can be tight and we tend to have very full parking lots. Unless you always park far away from other vehicles, Door Dings are bound to happen. Door Dings are dents caused by other motorists opening their door and accidentally striking the side of your vehicle. The swinging motion of opening the door and the edge of it striking your vehicle in the process can leave a bad, egg shaped dent on the side panels of your vehicle. Luckily, the dent repair experts at Dent Force Calgary are able to repair door dings with the Paintless Dent Repair process. The first step in repairing the door ding is to polish the dent to remove any impact scratching. This will give the technician a clear view of the dent and enable them to begin massaging the dent out from behind. The technician accesses the damage from behind the panel. Door skins are usually accessed through the window opening. We use a protective sleeve to ensure that we do no damage your window while we are repairing the door ding. Fenders and quarter panels are usually accessed from where the headlights or taillights are mounted to the vehicle. 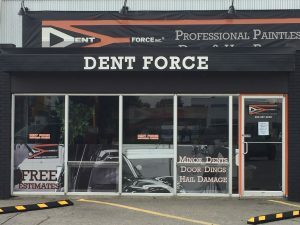 At Dent Force Calgary, our dent repair technicians have years of experience repairing door dings of all shapes and sizes. The Paintless Dent Repair process is much quicker than conventional dent repair. We can usually repair a door ding within a few hours or in one day. Calgary is known for it’s fast changing weather. One moment it can be sunny and it can be raining or hailing the next. It can be hard to get your vehicle to a sheltered place and avoid hail damage because of this. Hail, depending on the size of the hailstones falling from the sky, tends to create numerous, smaller, but deeper dents on the top panels of your vehicle from the hailstones hitting them. If the hailstorm also has high winds, your vehicle may have hail damage on the side as well. Thankfully, the dent repair experts at Dent Force Calgary are able to repair the damage with the Paintless Dent Repair process. Our dent repair technicians remove any trim and mouldings in the affected areas and access the dents from the backside of the affected panels. The vehicles headliner will be removed in order to access dents on the roof. The hood and trunk are removed so that the dents can be massaged out from the inside. At Dent Force Calgary, our dent repair technicians have years of experience repairing hail damage and dents of all shapes and sizes. The Paintless Dent Repair process is much quicker than conventional dent repair. Given that hail damage tends to create a large number of dents in a vehicle, it can take a fair amount of time to repair. Depending on the severity of the damage it could take anywhere from a day to a few days to repair your vehicle. Accidents happen in Calgary. Those accidents can take many different forms as well. From motor vehicle accidents to things as random as sporting accidents, there are many different things that could leave a dent in your vehicle. At Dent Force Calgary, we define a minor dent as anything larger in diameter than 50mm. We’ve heard all kinds of stories from baseballs getting batted off the field to soccer balls that went astray. Whatever caused the dent, the technicians at Dent Force Calgary can fix it. Given that the dents caused by incidents like this are a larger impact and a bit more abrasive to your paint, we normally have to polish out the impact scratching. After this, we begin to massage out the dent from behind the panel. Given that these dents are a bit larger in nature, they can take a bit more time to carefully massage out. Minor dents can normally be repaired by the paintless dent repair process within a few hours or a day. If you have a minor dent in your vehicle, bring it to Dent Force Calgary and let our technicians make your dent disappear. Don’t just take our word for it! Check out our awesome Calgary dent repair reviews. Dave Clarke and his team did an excellent job! Great service and quality work all around.Would definitely recommend Dent Force and will use them again in the future. Awesome work that was quickly and professionally executed. My vehicle looks like it rolled off the showroom floor. I can't thank you enough!! The only place that took our car in. All other places sent us to body shop. Awesome job by these guys, huge dent is gone. Friendly and professional service. Highly recommended! My mom recently got two shopping cart dents and the auto body shop quoted $1,200 to repair each one. Saw the Dent Force ad on Global and decided to give them a try. Received a quote for $300 to repair both dents. They were very friendly and completed the repairs the next day. My mom was very thrilled with their service and their quality of work. She couldn't tell where the original dents were. Very good quality for small dings and dents. Definitely recommend them. It hailed in Calgary and my SUV sustained damage from the hood to the tailgate. My insurer arranged for the assessment at Dent Force, and I witnessed a clean, well organized, and efficient shop for the 30 minutes I watched as they inspected every mark on my vehicle. Thorough work and great advice when I asked bodywork related questions. I left my vehicle with them that day, and they completed the job within days, meeting their delivery date and returning my SUV looking better than it has in years. Professional and friendly with great quality. It's not often you see a business run so well. Bring your bodywork here. You won't regret it. Incredibly good customer service and quality workmanship. I would recommend Dent Force to everyone. They efficiently coordinated removal of dents, as well as the parts ordering, replacement and repainting on my Mercedes. All I had to do was take it to them! The only place for all your Paintless Dent Repair needs! Have been dealing with Dent Force for years and they are always consistent and professional. Their goal is to make sure the customer is happy!!! Keep it up guys! A few weeks after getting a new vehicle, my wife ended up with a door ding. After shopping around and getting a few quotes, I decided to get the door ding fixed at Dent Force. Dent Force did an excellent job of removing the door ding. It's like the door ding never happened. They also helped take care of a paint scratch. I would not hesitate to use Dent Force again. 5 stars! These guys did a great job and I had gone to three places these guys were cheapest and got me in same week. Conveniently located just off Blackfoot with friendly staff and a great Christmas display. I worked late and they had stored my truck inside and until I got it the next day. The temp was -20 so that was pretty sweet! I got rid of some nasty dents via their Paintless Dent Repair. Thanks! !